For the rest of the summer, I'm going to be changing up my WINSday posts a bit. You'll still get a chance to win a product, but the great news is that if you don't win, you can purchase that product on SALE! 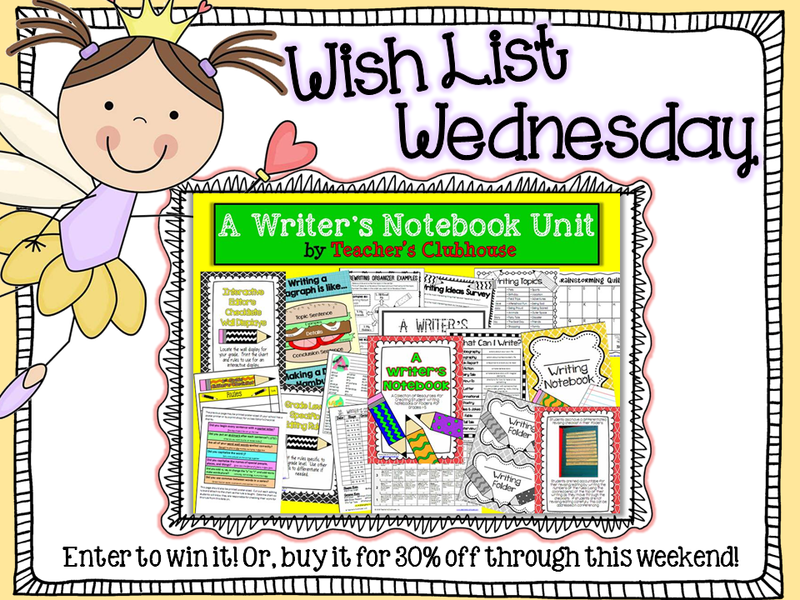 I'll be pulling some of our most WISH LISTED products on TpT to showcase and giveaway on Wednesday. That product will then be on sale through through that weekend! You can read more about our Writer's Notebook HERE. Enter to win it by commenting below with your least favorite thing about teaching writing. The winner will be announced tomorrow. If you don't win, you can grab it for 30% off in our TpT shop through Sunday! My least favorite part of writing is the editing portion. Children will edit yet won't use the corrections! My least favorite part of writing is trying to inspire students who continuously say, "I don't know what to write." My least favorite part is coming up with a creative ending! My favorite thing about teaching writing is listening to students share there work orally. My least favorite thing about writing is the editing part. I don't want to discourage my young writiers in anyway. I have to agree with a few others on the editing part being my least favorite. Sometimes it seems discouraging to the kiddos and sometimes it is just the management of editing 25 writing assignments! My least favorite piece of teaching writing is the grammar that goes along with it. BORING! My least favourite bit about writing is handwriting! Having to change my own handwriting style to cursive so I can model it correctly. My least favorite thing about writing is getting students to understand the importance of proofreading their work. My least favorite part of teaching writing is motivating the ones who just hate writing and then the revising...I agree that it becomes frustrating for some students and it takes awhile to do a class set. My least favorite thing about writing is motivating the students to write more. Some tend to think that 3-5 lines is enough for a paragraph or that is all they will write. Editing would follow. My least favorite part is when a student just doesn't want to write in the current genre we are working on. I never want to squash their creativity or desires, but I need to see how they apply the minilessons in their own pieces. It seems like I always have one kiddo that really wants to write something besides our unit of study. My least favorite thing about teaching writing is having the kiddos ask "how many sentences or how long does it have to be?" My least favorite thing about teaching writing is "how do you spell? "....Need I say more? Like many others, my least favourite part is getting the unmotivated writers motivated, especially when you know what they are capable of. Frustrating!! Writing has always been the biggest struggle for me. My least favorite part of teaching writing is editing. I have a great revising system but my 3rd graders rush through editing without truly editing. Not having enough time to spend with kids who need more individual help. And also what to do with the speedy finishers. And also what to do with the kids who write 6 pages of nothing! I could go on and on . . .
My least favorite thing about writing is finding a way to critique a student without them feeling like they are a failure, but letting them know what needs to be fixed. My least favorite thing about writing is when students sit and sit and sit and tell you they don't know what to write about even though you gave them many choices! All parts of writing are difficult, but editing is my least favorite. My least favorite part is that some students insist on spelling words correctly to the point that they can't finish their writing. Revising! My 3rd graders always seem to think that nothing needs to be changed about their writing and that there is nothing more to add. It drives me crazy! I enjoy teaching writing most of the year until it's state writing assessment time. The stress levels rise because they have to write to a very specific topic and it's timed. Your blog looks AMAZING! Love love love! My least favorite thing about writing is when the kids say they have nothing to write about. As if they have done nothing in their lives ever. EVER. My least favorite thing about writing is when students can't or don't want to think for themselves about what to write. My least favorite part about writing is trying to overcome my lack of self esteem as a writer. If I don't feel like a great writer than how can I inspire my students to become great writers. It's a difficult hurdler that I have to overcome each year. I've been working on it!!! My least favorite part of writing is the assessment. The time involved for three sections of middle school language arts papers is daunting. Beautiful new blog design. Megan did mine a well. She IS wonderful! My least favorite part is editing, by far! It just takes so long to do. This packet looks great! Also, I saw you have Boxers! My husband and I also have a Boxer named Duke. He is our baby! :) Who designed the drawing of you with your dogs? So cute! My least favorite thing about teaching writing is editing. My least favorite thing about writing is the fact that I feel like I can never truly take things through the writing process. I always feel rushed, never have time to conference, and feel like managing other students while trying to conference is IMPOSSIBLE! Basically -- the logistics and management! I really dislike grading writing, so if you have any tips for that, I am all ears! I'm not confident when I teach writing, I feel like it's a weakness for me. I don't feel like I learned enough in college or at PDs to feel really comfortable teaching it. Which results in my feeling like my students are getting the short end of the stick in writing. Teaching writing is my weakest subject. My least favorite thing about teaching writing is the amount of time it takes to edit and grade papers. GRRR!! My least favorite thing about teaching writing....is writing. I don't enjoy it and the time it takes to edit and read all the papers. Any help would be appreciated! My least favorite part of writing is not having enough time to do it. Writing does not seem to be valued in my school district despite having low writing scores. Finding the time to teach writing is very discouraging! Editing and writies drive me crazy AND so drawn out!!! Revising and editing always is a chore for me because so many students struggle with it. My least favorite thing about teaching writing is finding the time to individually conference and provide meaningful feedback to EACH student! It's so much easier to have kids share afterwords and then give some feedback, but that's tough to fit in during the writing process!! My least favorite thing about writing is the lack of time we have for writing to build each students' confidence. Since I work with all English Language Learners (ELLs), the writing process takes even longer! It could take us a very long time for finish one piece of writing. My least favorite part is the editing and revising. My students will meet with peers and barely correct the writing. My least favorite part of writing are the prompts. Kids hate them and they can be so boring. My least favorite thing about writing is that it is so time intensive. It seems to take forever to complete and I mean really complete to publishing. The little guys just don't seem to grasp that authors go through many steps before producing a final product. I loved reading how your writer's notebook are put together. I can see many changes coming to my student's notebooks this coming year. My least favorite part of writing is looking in the eyes of someone who has so many ideas in their head, yet seems stuck on the phrase "I don't know what to write". My least favorite thing is correcting it. I love the creativity and the ideas the students come up with! My least favorite thing about writing is limiting my students' creativity by placing too many restrictions, ie..grammar, punctuation, etc..
My least favorite part of writing is teaching editing and revising. It is difficult to get the kids to understand why they need to change or add to what they have written. I don' t have a good way of teaching the revising and editing of a piece. My least favorite part is having to correct their work. Sometimes I feel it stifles their creativity. My least favorite part of teaching reading is grading all of the writing!!! LOVE, LOVE, LOVE the new look!!! Megan is my favorite and I will totally use her for my next design!! Pink and gold...swoon!!! I can't keep up with where 28 students are in their writing process and trying to score it all. Also, I just don't enjoy it! I was a journalist for several years before I got into teaching and Writing is one my least favourite subjects to teach *hangs head in shame. * Marking the finished products is what I dislike the most about it!!! This looks like an absolutely PHENOMENAL resource!! I would be absolutely honoured to be the VERY LUCKY recipient of this literacy gem <3 <3 <3. Thank you for your incredible generosity and for considering me =). leafsgirl@rogers.com. I think my response flew out in cyberspace, so I'll try again. Writing is easy for me to do, yet so hard for me to teach! I think it's the time management of it all. I teach a step, then wait for them to do it. All hands go up to tell me something, ask something, or want to be checked. What to do? It take so much time!! My least favorite thing about teaching writing is helping first graders to realize that they have tons of things to write about. They always say, "I don't know what to write about!" My least favorite thing about writing is not having a "curriculum" or program that I can use to teach writing. This is my first year using the Journey's reading program and it incorporates writing but I don't like how it is laid out. I would love to use units like you do. My least favorite part of teaching writing is not getting frustrated when students constantly say "I'm done" when they haven't met basic expectations! They don't want to add details or edit...augh!! My least favorite part of teaching writing is editing their papers. I also can't stand it when students don't make the corrections we have just gone over because he/she is in a rush. My least favorite part about teaching writing is editing papers. No matter how many checklists the children have they always leave out capitals and punctuation. My least favorite part is motivation for those who don't like to write and editing! It's a struggle for little guys to edit sometimes. My least favorite part is that it is all so overwhelming! Conventions, genres, organization, word choice, sentence elaboration... I have a hard time organizing my teaching to get it all done. My least favorite thing about teaching writing is revising. Some students will correct some grammar errors and want to be done. They don't want to reread and add to or change the actual content of their piece. I just need to figure out a good way to get past that with those students.